It’s salad weather, and my go-to green is spinach. As a flexitarian (somebody who doesn’t eat meat all that often), I’ve always appreciated that spinach is a nutritional powerhouse and a rich vegetarian source of iron. After all, Popeye ate it, and check out the biceps on that guy!! In the 1930s, the Popeye cartoon was responsible for increasing spinach consumption in the U.S. by over 30%. He was quite a culinary influencer! Imagine my surprise when I came across the Spinach Popeye Iron Decimal Story, also known as SPIDES. A popular story arose during the 1930s, describing how a German chemist misplaced a decimal point when reporting the amount of iron found in spinach. This “theory” on the incorrectly calculated nutritional impact of spinach spread quickly. While many Americans had been increasing their spinach intake, they were now questioning whether it was as rich in iron as they previously thought. What is interesting about this theory is that the source of SPIDES has never been provided (as far as we know), despite it being published repeatedly. An interesting and humorous article by Dr. Mike Sutton discusses this oft-repeated spinach story, pointing it out as an example of what my friend Gil Marks refers to as a “bubbe-meise” (Yiddish – grandmother’s tale, meaning wives’ tale). In our modern internet culture, we often take what we read as fact and rarely seek out the original source of the information. 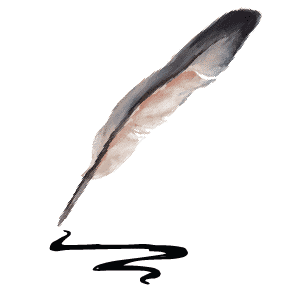 All too often, the articles we assume to be true are simply regurgitating from another ill-informed source. This is one of the reasons I try my best to site my research sources on this site; I encourage readers to dig deeper, learn more and report back their findings. It’s a collaborative effort here, folks! Even now the SPIDES story is regularly retold as fact, when the truth is nobody seems to have access to the original source. Food for thought! So, what’s the skinny on spinach? It is true that this leafy green contains more iron than red meat, but the levels that can be absorbed by the human body are much smaller. However, that doesn’t mean we should shrug off spinach. It’s a very healthy green, and I try to work it into my diet regularly. In addition to its iron benefits, spinach is also high in vitamins K and A. This salad is a delicious way to prepare it. Our market shelves are crowded with ripe, succulent stone fruit at the moment. 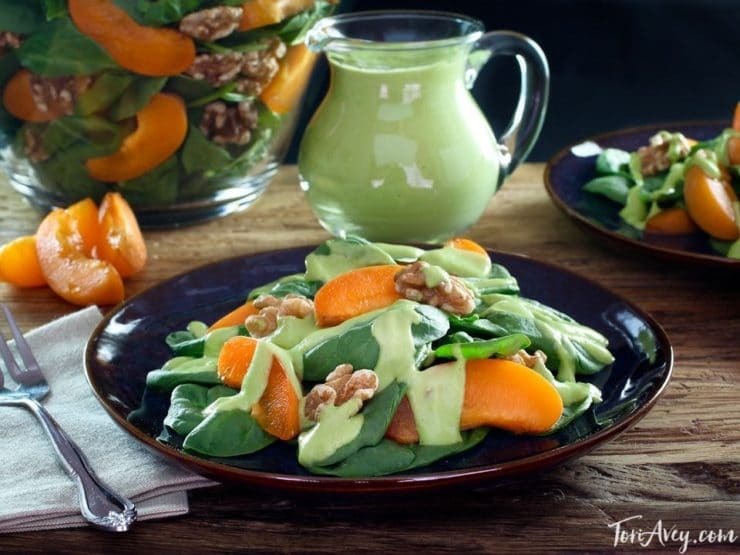 Inspired by a batch of perfectly sweet apricots, I created this Apricot Spinach Salad with a creamy, lemony avocado basil dressing. The flavor is fresh, layered, and unique. 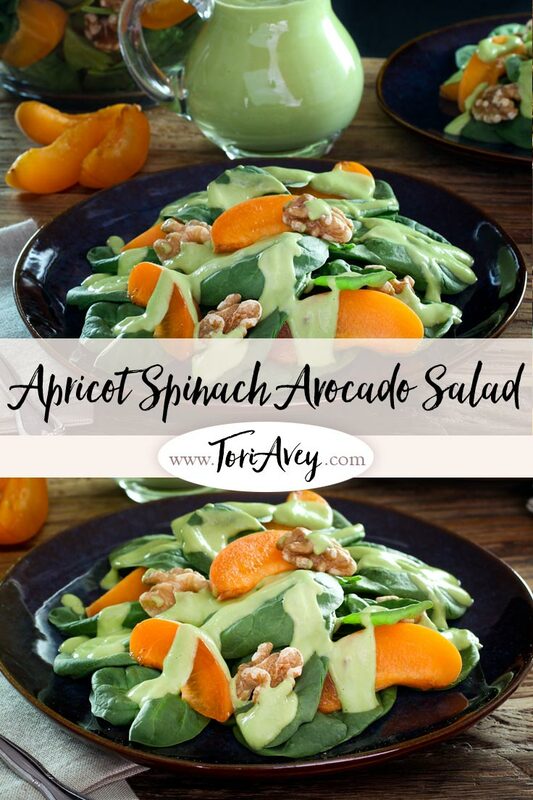 The creamy vegan basil dressing is a perfect compliment to the sweet apricot slices, and avocado provides a dose of healthy fat. Toasty walnuts give it another dimension. 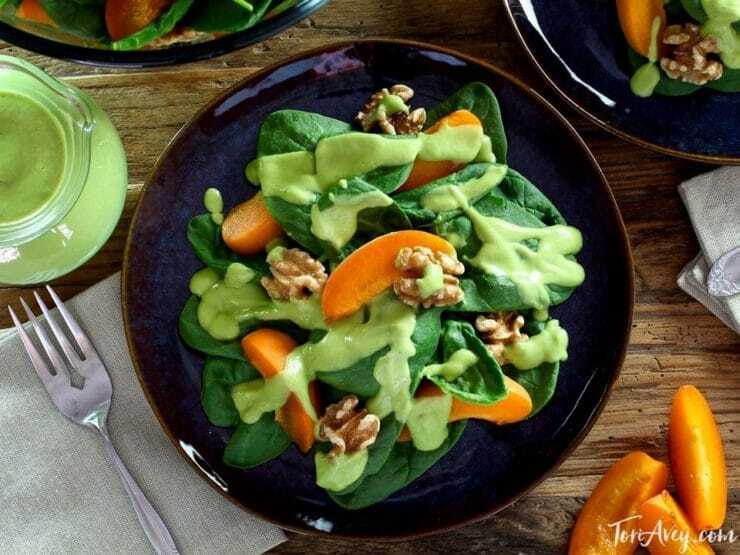 It’s a new, summery twist on spinach salad. Popeye would most certainly approve! 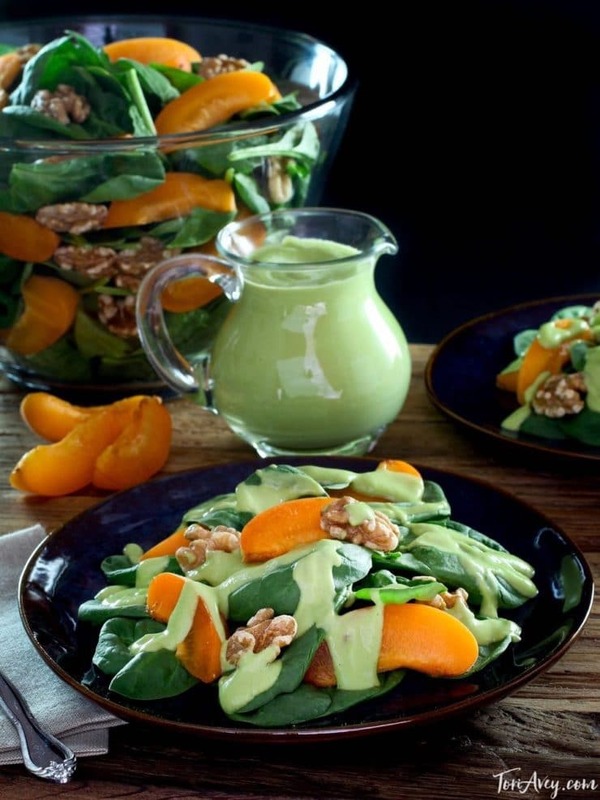 A tempting vegan salad with fresh spinach leaves, toasted walnuts, ripe sweet apricots and creamy avocado basil dressing. 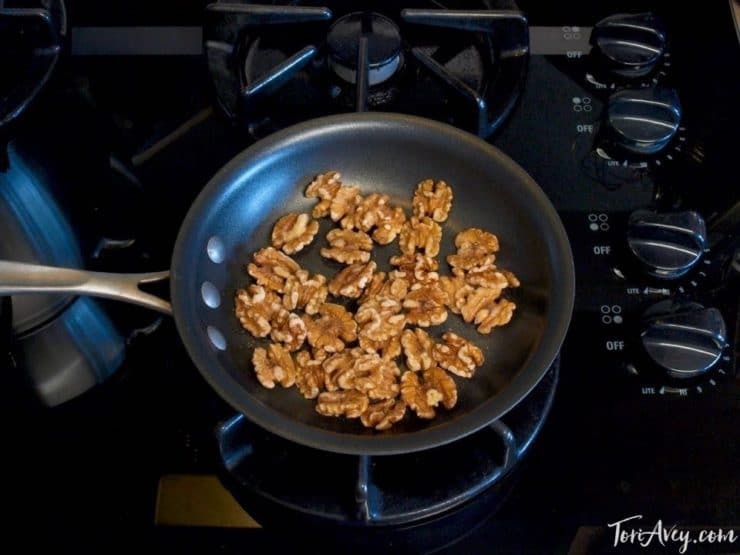 Toast the walnuts in a skillet over medium heat until they begin to brown and smell toasty. Remove from heat. Combine spinach, walnuts, and apricot slices in a large salad bowl and toss gently to combine. 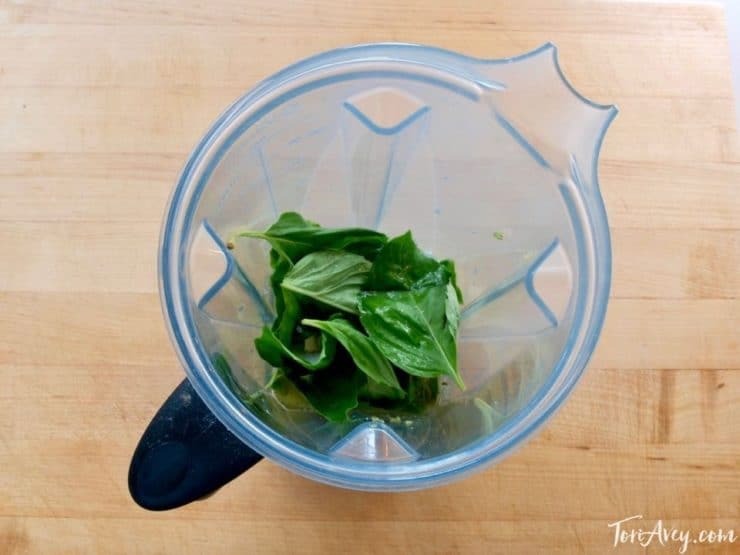 Combine dressing ingredients in a blender and process until smooth and creamy. Do not over-process in order to preserve the color. If the mixture is too thick and not smooth enough to easily pour, stir in water a tablespoon at a time until a dressing consistency is reached. Serve salad portions drizzled with dressing. The dressing may be made a few hours ahead; store it in the refrigerator with plastic wrap touching the surface of the dressing to prevent browning. Best made the day of serving to preserve color and freshness of flavor. Sutton, Mike, Dr. “SPINACH, IRON and POPEYE: Ironic Lessons from Biochemistry and History on the Importance of Healthy Eating, Healthy Scepticism and Adequate Citation.” Internet Journal of Criminology (2010): 1-34. 2010. Web. 6 Aug. 2014. Wright, Clifford A. (2001) Mediterranean Vegetables: A Cook’s ABC of Vegetables and Their Preparation in Spain, France, Italy, Greece, Turkey, the Middle East, and North Africa with More than 200 Authentic Recipes for the Home Cook. Harvard Common, Boston, MA. 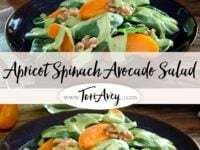 I can’t get fresh apricots in produce section yet for spinach salad recipe with basil avocado dressing. What other fruit can be used? tori, how right u are regarding info on the internet!!!! i have been baking bread for large numbers of people since i was nine years old. i use wild yeast starter for leavening; haven’t bought yeast in prolly 20 years. some of the “new Artisan” recipes posted on the net are absolutley preposterous, even from the big name bakers. they could not possibly have tried their own recipes!! i’m not talking about slight mistakes of a tablespoon or so in the ingredients, some are off by 2 or more cups. i got interested in these recipes cuz i have always thought in terms of ratios of water to everything else. these artisan guys insist on ratios of flour to everything else and i wanted to do some learning in the proper way. my success rate initially was only 50-50. i’m getting better now but if i’m in a hurry i just estimate how many loaves of particular shape and start with warm water then throw in the rest depending on how sticky i want the dough to be. so…..read thru the recipes and use a little common sense and maybe u can spot the idiocy before u get in the middle of a mess. happy baking. So happy you liked it Lisa! Please could you email your recipe for the cauliflower salad. I saw. It posted on someone’s Facebook page but now can’t seem to find it again! This is just perfect!!! So summery and perfect. I just love creamy avocado dressing soo much. So good. Are raw spinnach leaves safe to eat? Zeineb of course! As long as they’re thoroughly washed. I eat raw spinach 5-6 times a week. It’s as safe as any other leafy salad green (lettuce, arugula, etc.). How long will the dressing last if refrigerated? Is it an “eat immediately” type thing? Jilayne it will last for a few hours in the fridge, but I wouldn’t keep it longer than 4-5 hours or it won’t taste as fresh and it may lose its color. Definitely ok to make ahead by a few hours, though. Also make sure you cover it with plastic wrap and push the wrap all the way down to touch the surface of the dressing, covering it completely. Otherwise it may discolor. Kimberley yes, apricots will work well for a peach melba. You can make a coulis with pretty much any sweet ripe fruit, as long as you follow the process of straining through a mesh strainer and cooking down to the desired thickeness/consistency. That looks so yummy……..and I’m about to go to lunch. Can I come by and eat the salad?